Of all of the bits of review kit that I’ve had the pleasure of using, the Acer Aspire S7 is the one that has gathered me the most questions and comments. “That’s a thin laptop,” says the man on the train. “It’s the same thickness as my phone” says my girlfriend. Indeed, the very first thing you’ll notice about this ultrabook is its size – at just 12.3 mm, it’s svelte to the extreme, thinner even than the iconic MacBook Air and advertised by Acer as the thinnest Ultrabook ever. But you can’t sell an Ultrabook on looks alone – although Acer have tried, with a fairly good ad featuring Megan Fox as a marine biologist. To be truly worth of its £1149 price tag, it needs to perform well too. 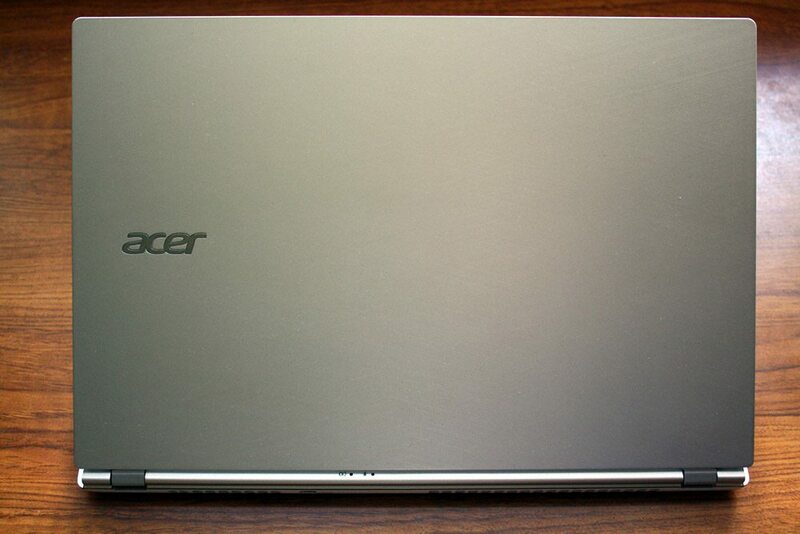 In this preview, we put a pre-production Acer Aspire S7 to the test. As it is an engineering sample produced in June, its configuration differs slightly from what will be available at retail and it is running a test version of Windows 8. For this reason, we won’t be examining hardware performance in any great depth. We’ll still give our first impressions of the ultrabook though, and will update with a full review as soon as we receive our retail unit. Here are the specifications for our review unit – it’s important to note that the retail version comes with a much better 1080p display (that I loved in the Acer W700 tablet) and a choice of i5 or i7 processors and 128 or 256 GB of storage space. 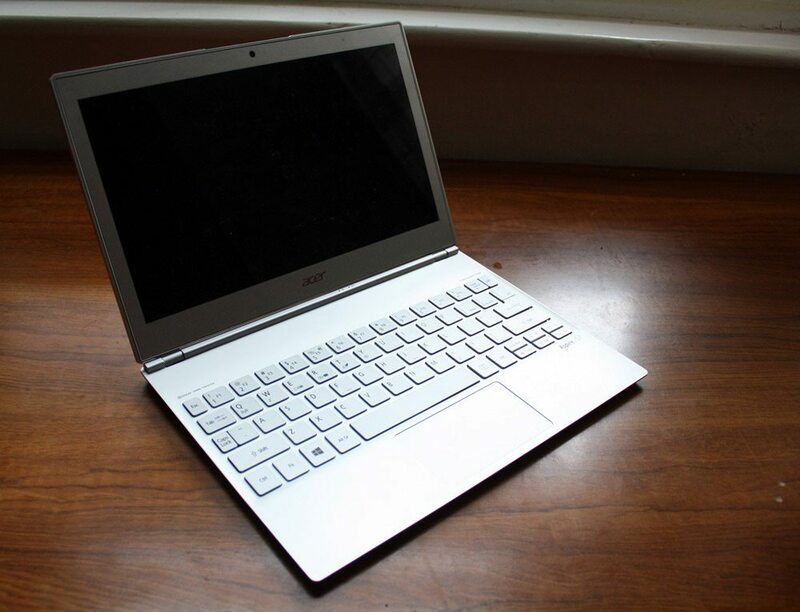 The Acer Aspire S7 comes in Acer’s by now standard white box (unfortunately disfigured by PR labelling in our example) with carefully proportioned black compartments within, with fabric pull tabs where appropriate. It’s all very nice, and as you’d expect from a premium product such as this one. You don’t get any extras though – just the laptop and its slimline charger. The Aspire S7 is a stunning laptop, there’s no question about it. While its dimensions undoubtedly contribute a large part towards that, the actual design itself is also top-notch, without merely aping Apple’s popular MacBook Air. The chassis is a combination of brushed aluminum on the top and white plastic on the bottom. The display is wrapped entirely in aluminium and base is covered in similar looking plastic, so the gently receding white plastic at the bottom of the stack isn’t really noticeable until you flip the laptop over. The laptop is fairly light but it feels very solid in the hand – you’ll be hard pressed to notice any give or flex in it even if you try. The top of the laptop’s brushed aluminum looks fantastic, with a subtle pattern that shifts in the light. You’ll find the power and charging notification LEDs here, near the middle of the back of the device. 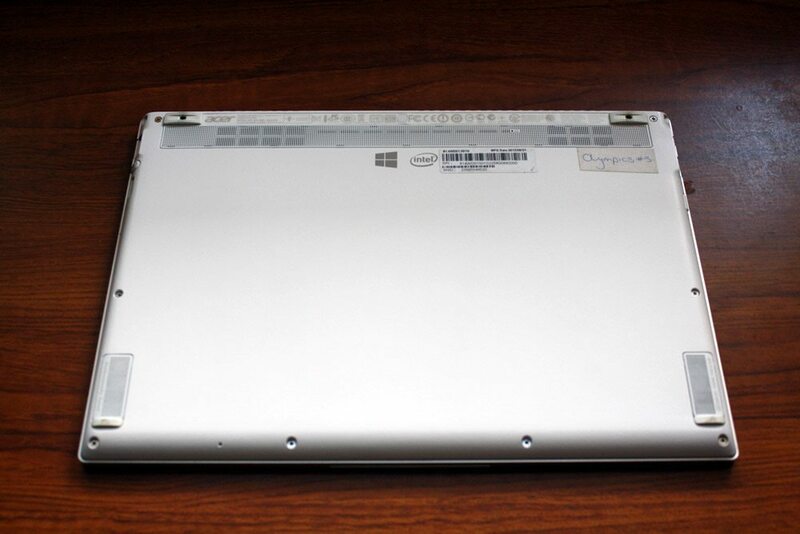 The positioning ensures that these are visible whether the laptop is open or closed. Turning the laptop over, the white plastic is nicer looking than it sounds. Labels and icons have been relegated to the top of the laptop – take off the sticker, and you’ve got a beautiful looking laptop, although not quite as nice as Apple or Vizio’s offerings.There are stereo speakers with Dolby Home Audio branding on the bottom near the front, with heat vents near the rear.